For men called to a “second vocation” – Catholic priesthood later in life following a secular career and family life – patience is on the list of qualifications. And, Mike Galbraith has patience. Leaving his home state of Texas last summer, Mike made the move to Juneau at the invitation of Bishop Edward Burns to serve a pastoral year of discernment for the priesthood here in the Diocese of Juneau. A former Sacred Heart School of Theology classmate of Fr. Steve Gallagher’s (who was ordained to the Diocese of Juneau priesthood in 2011 at age 58), Mike has completed his academic formation for the priesthood, has worked in parish ministry in Texas and now in Alaska he hopes this is the final leg of his journey toward priesthood. 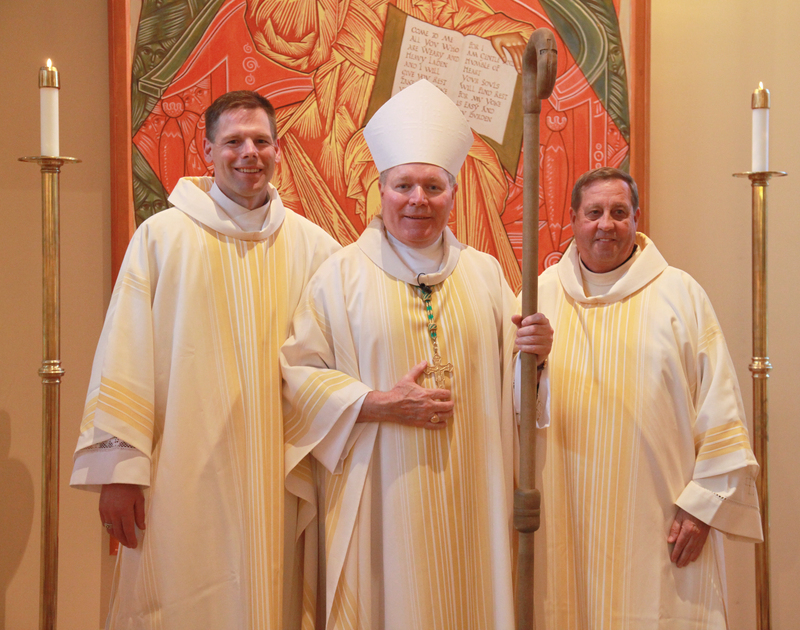 Mike Galbraith (right) and Steve Olmstead (left) were ordained as deacons for the Diocese of Juneau on May 29, 2015 by Bishop Edward Burns (center). “I initially had plans to become a Dominican priest, but as it turned out the time was not right,” Mike explains about his younger years. Sometimes the call of the Holy Spirit is clear, but the timing isn’t right. Born in 1952 and a lifelong Catholic, Mike attended Catholic schools in Dallas and remembers having an inclination toward the priesthood since the age of 10. His Catholic parents gave him and his 3 sisters their choice of schools – public or Catholic – and Mike chose Catholic. He recalls their father demonstrating a commitment to spiritual growth by attending Catholic retreats on a regular basis. Following the sudden and tragic death of his mother while Mike was still in his teens, he graduated high school and then chose to attend Texas Tech University on a track and ROTC scholarship. He eventually earned an undergraduate degree in Physical Education and a Master’s degree in Exercise Physiology. After serving in the Air Force Reserves and working various jobs, he began a career in the pharmaceutical industry that spanned 25 years and included specializing in neurology and drugs to treat Alzheimer’s disease. In 1999, Mike’s marriage of 23 years ended in divorce. His daughter (now married) and son (engaged) both still live in Texas. Finally, the persistent call from the Holy Spirit that he had first heard as a youth became so loud that Mike couldn’t ignore it anymore. At the age of 52, he approached his San Antonio parish priest and asked about the possibility of becoming a deacon. Explaining that preparation for the Diaconate would take only a few years less than preparation for the priesthood, his parish priest suggested the latter. And that began – or rather continued – a journey of patience and persistence toward the priesthood. Mike’s sisters, including his twin sister, were thrilled that he was finally answering the call to priesthood. His son, still in college at the time, was initially less enthused. After Mike explained that life wasn’t a ‘free ride from Dad,’ that his son could and would get a job, and that God would take care of and provide for him, things eventually improved. Many dioceses in the United States will not accept applicants for the priesthood who are beyond a certain age, but Mike eventually found that the Forth Worth, Texas, diocese accepted second vocation men, in part because of their maturity and past experiences in life, as well as their lower drop-out rate. After serving 3 years of discernment to the ministry, in 2008 he was finally able to enter the seminary at Sacred Heart School of Theology just outside of Milwaukee, Wisconsin – a school which specializes in training second vocation men. Unfortunately, once appointed, the new bishop did not adopt his predecessor’s policy of ordaining older, second vocation men to the priesthood and declined to ordain Mike to the diaconate or priesthood despite his 7 years of preparation. At the encouragement and assistance of his friend and fellow classmate, Fr. 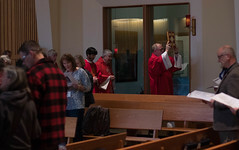 Steve Gallagher, Mike approached Bishop Edward Burns about the possibility of transferring to Alaska and being ordained for the Diocese of Juneau – a diocese that had recently demonstrated its willingness to accept older men as priests with the ordination of Fr. Steve in 2011. Having traveled by car from Wisconsin to Ketchikan with Fr. Steve in December of 2010 following Fr. Steve’s graduation, Mike was acquainted with the Southeast Alaska diocese and already knew that he loved this beautiful area. 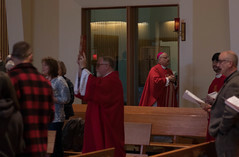 Bishop Burns responded by inviting Mike to visit Alaska and serve a Pastoral Year in the diocese – to spend time becoming acquainted with the people and culture of Southeast Alaska, to assist in ministry, and to discern whether the diocese would be a good ‘fit’ for him and him for the diocese. Fr. 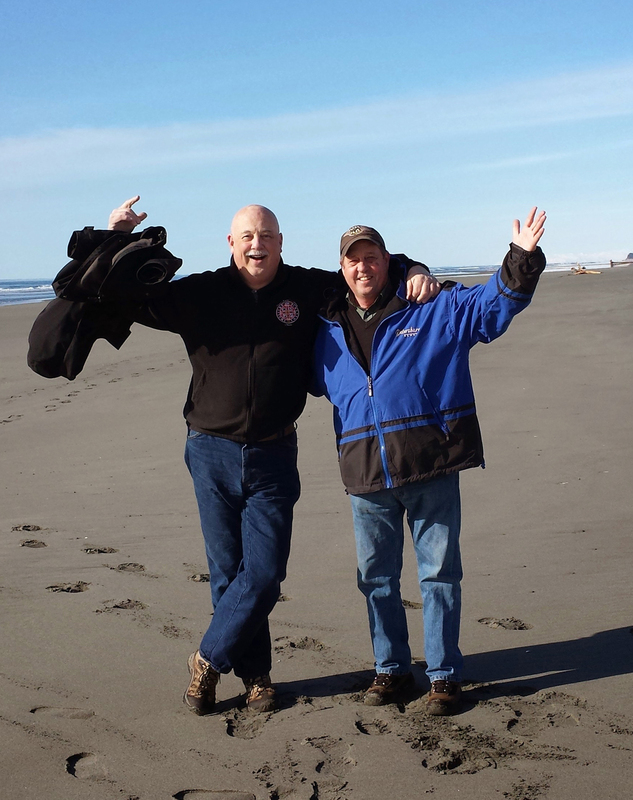 Steve Gallagher (at left) and Deacon Mike Galbraith (right) enjoy a walk on the beach in Yakutat, AK. Bishop Edward Burns announced in July, 2015 that Deacon Mike Galbraith will be ordained to the priesthood for the Diocese of Juneau on Friday, October 23rd, 2015 at St. Paul the Apostle church in Juneau at 7:00 p.m.